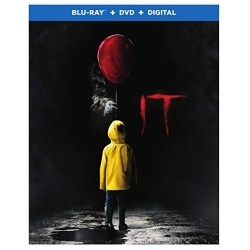 Warner Home Video kicked off the year with the Blu-ray and Ultra HD release for It on January 9th, 2018. Chase Palmer, Cary Fukunaga and Gary Dauberman wrote the screenplay for this supernatural horror film, based on the novel from Stephen King. The film tells the story of seven young ‘outsiders’ who in live in Derry, Maine. The children are terrorized by a shape-shifting being that forces them to face their own personal demons. The movie opens in October 1988, where teenager Bill Denbrough gives his seven-year-old brother a paper sailboat. Georgie follows the boat down the rainy street, when it is lost down a storm drain. When he attempts to retrieve it, Georgie sees Pennywise the Dancing Clown in the sewer. The clown entices Georgie to come closer, when he grabs Georgie and drags him into the sewer. The following summer, Bill and his friends spend their time avoiding bully Henry Bowers and searching for Georgie. New kid at school Ben Hanscom learns that the town has been plagued by unexplained tragedies and child disappearances for centuries. The group also befriends Beverly Marsh and homeschool student Mike Hanlon. Each member of the group has had terrifying experiences in various forms, including a headless boy, a diseased man, a creepy painting come to life, and the menacing clown. They realize they are all being terrorized by the same entity that assumes the appearance of what they fear. After an attack by Pennywise, the group sets out to confront the entity, but what hope to they have of defeating the supernatural creature? It is a very strong and provocative horror thriller, taking its place among the recent trend of high quality films in the genre. Formerly horror movies seemed to often come with a side of cheese, making them fun for fans of the genre, but hard to take seriously. Here we have a film that takes the best elements of the novel and presents a movie that solidly delivers both technically and emotionally. The seven young teens that take on the evil in Derry form a bond throughout the story that feels natural and authentic. The frights and scares feature a dynamic performance for Pennywise the Clown, with interesting and disturbing framing and editing. While the horror elements are center stage, we also get a story of camaraderie and friendship – themes that add the depth you need to draw you in. I highly recommend It to fans of Stephen King and the horror genre, and even for those who are just curious. Be aware though that the film is genuinely creepy and features violence against children, which some may find hard to watch. The cast features mostly newcomers, including Bill Skarsgard, Jaeden Lieberher, Wyatt Oleff, Jeremy Ray Taylor, Sophia Lillis, Chosen Jacobs, Finn Wolfhard and Jack Dylan Grazer. It was directed by Andy Muschietti, who will also direct the sequel It: Chapter Two, to be released in September 2019. The movie has a very strong critical reception, with a Rotten Tomatoes score of 85%. It was also met with largely positive public response, with an IMDb score of 7.6/10. It was also a big success in the cinema, taking in $327.5M at the US box office. With $700 million in ticket sales worldwide, it is the highest-grossing horror film and the third highest-grossing R-rated film of all-time. The video on the disc is an AVC 1080p encode at 24 Mbps, and is presented in its original aspect ratio of 2.40:1. The movie features bright outdoor scenes, as well as dark and disturbing interiors, with everything being rendered cleanly. Image quality is excellent throughout, and helps draw you into the story, which is downright creepy. See the details page for It for full resolution PNG screen captures taken directly from the disc. The main audio is Dolby Atmos object based audio, which down-mixes to TrueHD 7.1 if you don’t have an Atmos decoder. The disc is a dual layer BD50, with 43.4 GB used and is coded for All Regions. 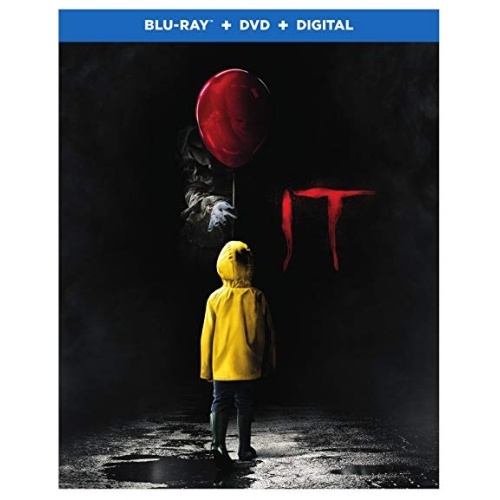 The Blu-ray release for It has around an hour of supplemental features, including a collection of featurettes and deleted scenes. This featurette introduces the new Pennywise, with the director and producer discussing their goals for the character. Actor Bill Skarsgård weighs in a great deal on how he portrayed the character. The rest of the cast also talk about their experiences working with Pennywise, who was kept away from the others to increase the intensity of the young actors’ reactions. The young cast members for the film discuss their roles and their experiences making the film. The themes of friendship and collaboration play strongly and are covered here. The characters are all members of The Loser’s Club, a group of teens who are ostracized from the cool crowd due to their race, personality, or physical characteristics. The film makers arranged activities for the young cast in order to create a camaraderie that carried over onto the screen. Author Stephen King discusses the roots of his best-selling novel in this fascinating featurette. King talks about the nature of childhood fear and how he incorporated legends and stories from his home town. Mamy personal memories were also incorporated into the story. A collection of eleven deleted or extended scenes that never made the final cut of the film. The extras certainly offer a great deal of insight into the story and the creation of this new movie version of It. It is a very strong Stephen King adaptation that continues the recent trend of solidly produced horror films. Warner Home Video has assembled an excellent Blu-ray release, with a technically strong presentation and an hour of supplemental features. The retail price is $35.99, though you can get it at Amazon for $24.99, saving 31%! This entry was posted on Tuesday, January 16th, 2018 at 9:24 pm	and is filed under Atmos, Blu-ray, Commentary, Drama, Horror, Thriller, Warner. You can follow any responses to this entry through the RSS 2.0 feed. You can skip to the end and leave a response. Pinging is currently not allowed.